Call Coaching is a new solution for some – but the lessons learned for those on the program are invaluable. I know it’s football season, but here’s disclaimer for you before reading on: coaching isn’t just for sports, it is for everyone. In fact, some of the most successful people have coaches, whether it is a fitness coach, life coach, business coach, or in CallSource’s expertise, a call coach. CallSource introduced Call Coaching to our deck of business tools in 2016 to help our clients improve their businesses even more. The program has been thriving ever since. Unsure how call coaching can benefit your business? Well, why not hear from other business owners about how call coaching has helped them. There is always room for improvement—and some people need to see others succeed to motivate for self-improvement. Ever wonder why people trying to lose weight are usually more efficient and successful when they have group support with the same end-goal as them? According to The Alliance by Reid Hoffman, “75% of employees say that they’re willing to use their own time to further their careers and take on additional learning that would benefit them at work”. Seeing others improve themselves encourages team members to want to improve, too. You CAN teach an old dog new tricks! Experience and seniority in a job are helpful, but there is always room for more learning and improvement. Just because someone is good at their job does not mean that they cannot get better. Having a call coach doesn’t mean that your call handlers don’t know what they’re doing—it just means that they are being invested in to always be at their fullest potential and to advance the skills they already have to stay consistent. 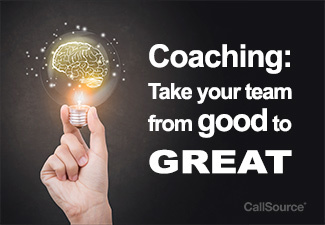 CallSource believes that call coaching gives your call handlers the tools they need to go from good to great. Everyone gets busy, but it is important to stick to tasks to achieve your goals. To use the losing weight comparison again, you never regret a workout once it’s done! Taking steps to improve is hard and takes consistency, and as long as you stay consistent, you’ll be happy you did—even if it seemed impossible at the time. If you are ready to hear more about Call Coaching, please reach out to a CallSource representative. We’ll be glad to answer any questions you may have.